Easily close the starling resistant entrance doors on one of your existing S&K purple martin houses with these S&K Crescent Door Plugs. This set of 12 plugs easily covers the starling resistant openings on your existing S&K American Barn, Heavenly Haven, Farm and Home, Natural Gourd, or classic Purple Martin house (not included), allowing you to leave the shelter in place during the winter without fear of starlings or sparrows overtaking it. The bottom tabs and top clip on each plug keep them securely affixed to your martin house, and their plastic construction blends with the shelter. The crescent shape of these units fully covers the starling resistant entries on the home, and the white pieces are simple to remove when it is time for your martins to return. 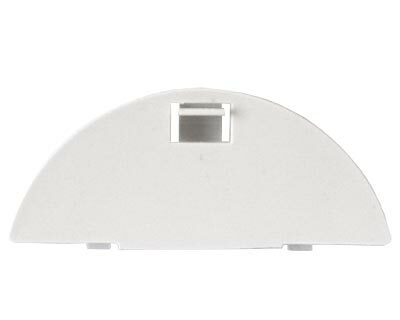 Stop starlings and sparrows from overtaking your existing S&K purple martin house with 10 to 12 rooms using these Crescent Door Plugs. Made in the USA.